The Gun Quarter is a district of the city of Birmingham, England, which was for many years the centre of world’s gun-manufacturing industry, specializing in the production of military firearms and sporting guns. It is an industrial area to the north of the city centre, bounded by Steelhouse Lane, Shadwell Street and Loveday Street. The first recorded gun maker in Birmingham was in 1630, and locally made muskets were used in the English Civil War. By the 1690s Birmingham artisans were supplying guns for William III to equip the British Army. The importance of the trade to the town grew rapidly throughout the 18th century, with large numbers of guns produced for the slave trade. The 19th century saw further expansion, with the Quarter meeting the demand for the Napoleonic Wars, Crimean War, American Civil War and the furthest outposts of the British Empire. During both the First and Second World Wars the area played a major role in the manufacture of small arms for the British Armed Forces. After the First World War demand fell; the need for skilled, specialized labor fell as the market became flooded with cheaper, machine-made guns, and gun manufacturing in the area began a slow decline. In the 1960s, a large part of the Gun Quarter was demolished by post-war town planners, with the area split in two by the construction of the Birmingham Inner Ring Road. Following the Big City Plan of 2008, the Gun Quarter is now a district within Birmingham City Centre; however, there are not currently any plans in place to redevelop the Gun Quarter, and many buildings in the area are disused. During the early to mid-17th century Birmingham’s population numbered only several thousand; the town was home to many foundries and workshops that made a wide variety of metalware, including guns. Sir Richard Newdigate, one of the new, local Newdigate Baronets, approached manufacturers in the town in 1689 with the notion of supplying the British Government with small arms. It was stressed that they would need to be of high enough calibre to equal the small arms that were imported from abroad. After a successful trial order in 1692, the Government placed its first contract. On 5 January 1693, the “Officers of Ordnance” chose five local firearms manufacturers to initially produce 200 “snaphance musquets” per month over the period of one year, paying 17 shillings per musket, plus 3 shillings per hundredweight for delivery to London. St Mary’s Chapel in Whittall Street was a focal point of the area. It was demolished in 1920s to make room for the expansion of the General Hospital in Steelhouse Lane. At the start of the 18th century, gun manufacture was concentrated in the Digbeth area, but fifty years later the trade had moved to the present-day Gun Quarter. Many of the gunsmiths also expanded to less cramped parts of the city – the Gun Quarter is a very small area, and early accounts describe many “higgledy piggledy” houses and factories with different gun shops and gunsmiths residing in close proximity to one another. A commemorative plaque in the Gun Quarter claims that around this time Birmingham was the “foremost arms producer in the world”, the town’s closest rival being London. By the end of the 18th century the Gun Quarter had become a thriving gun-manufacturing community. Government viewing rooms were opened in Bagot Street in 1798, employing sixty or seventy people to ensure that guns produced were of the necessary standard to provide for the British army. Military use, however, was accompanied by a major market in the Atlantic slave trade. A 1788 Parliamentary report counted over 4,000 gun makers, with 100,000 guns a year going to slave traders. Photograph of the now demolished St. Mary’s Row, viewed from Loveday Street. W W Greener, Prize Gun Works is on the right. The British Government began to rely heavily upon the skilled gun manufacturers of the town. The Napoleonic Wars required special efforts, and between 1804 and 1817 a total of 1,827,889 muskets, rifles, carbines, and pistols were manufactured for the Government alone. 3,037,644 barrels and 2,879,203 locks were made and then delivered to London for assembly, and around 1,000,000 items were also delivered to the East India Company, which fought alongside the British forces. It has been estimated that production of guns and components between 1804 and 1815 averaged more than three-quarters of a million items per annum, more than two-thirds of England’s production during this period. Birmingham Proof House was built in 1813, then one of only two such proof houses in England, the other being in London. The building was managed by a consortium of the town’s gun traders, its purpose being to ensure that the guns manufactured in the area were safe for use. It is still in use. The number of firms in Birmingham’s gun industry was 125 in 1815, 455 in 1829 (two-thirds of these in the Gun Quarter), and by 1868 there were 578 gun firms in the city. The trade employed 2,867 people in 1851, out of a total of 7,731 in the whole of England and Wales. “Gun-makers” did not usually manufacture the parts for their guns or even assemble them: in keeping with the traditional nature of Birmingham’s manufacturing industries, parts were manufactured by independent specialist sub-contractors and assembled by “fabricators” or “setters-up”, the “makers” commissioning and marketing the completed guns. In the late 18th and early 19th century, barrels were mainly manufactured outside the quarter (in Aston, Deritend, Smethwick and West Bromwich), and locks were mainly sourced from the Black Country, but other parts were usually manufactured and assembled within the Quarter. In the late 19th century, Showell’s Dictionary of Birmingham listed more than fifty specialist trades involved in gun manufacture, “till late years most of them being carried on under different roofs”. The Crimean War brought much business to the gun makers of Birmingham, and from 1854 to 1864 more than 4,000,000 barrels were proved there. Most military gun stocks were made from walnut, whereas for the cheaper African market common beech was used. During the Crimean War a large saw mill was erected in Turin by a gun maker from the quarter, and nearly a third of a million gun stocks were produced from this source alone. The Birmingham Small Arms Trade Association had supplied many of the guns during this period, and in 1861 fourteen of these gun smiths formed the Birmingham Small Arms Company (BSA). It is estimated that around 800,000 weapons were shipped from Birmingham to America during the latter’s Civil War. One of the main suppliers was William Tranter, who supplied revolvers to the Confederate forces. General Custer is known to have owned a Galand and Sommerville .44 revolver, which was faster to load than existing American pistols. By the nineteenth century, the introduction of the percussion system combined with the adoption of modern production methods led to Birmingham becoming the dominant producer in British firearms. A few London makers remained, such as the government-owned Royal Small Arms Factory in Enfield but Birmingham produced the majority of the firearms in Britain. During this time the Gun Quarter made a variety of calibre weapons from high quality to the less elaborate. In general, British weapons were well made, but less decorative than those produced on the continent; above all they earned a reputation for reliability and fine craftsmanship. The outbreak of World War I saw the Government once again approach Birmingham engineering companies with the prospect of arms manufacture, and within a matter of weeks Birmingham and the Gun Quarter witnessed much preparation for ammunition and gun manufacture. Many of the workers were women due to the enlistment of men into the armed forces. The increasing mechanisation of gun manufacture in the US and Europe was a significant step in the decline of the Birmingham gun trade, which had for centuries been based on the skilled specialist craftsman. The mass-produced, so-called ‘ready-made’ guns began to flood the market in the 1880s; the number of Brummies employed by the trade fell from 5,500 in 1881 to 4,100 in 1911. The trade continued to contract from this point onwards, despite the massive increase in demand during two World Wars, demand fell through the floor as soon as hostilities ceased. This along with the failure of many established firms to adapt to modern technical advances in machine manufacturing meant that they failed to maintain competitiveness in a challenging market. 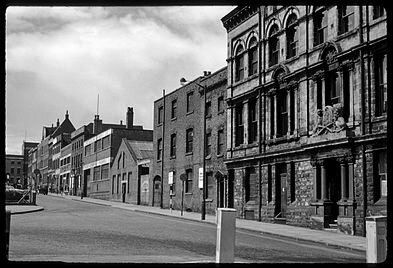 In the 1960s, many of the traditional workshops of the Gun Quarter were demolished by post-war town planners, with the area split in two by the construction of the Birmingham Inner Ring Road. In 1963, a local newspaper, the Sunday Mercury announced the ‘Death of Gun Quarter’. Today only a small handful of gun manufacturers and traders remain in the Gun Quarter. The last remaining large gun and rifle manufacture in the area is Westley Richards. Due to the UK’s severely restrictive laws regarding gun ownership, including sporting arms, there is only a small commercial market for firearms in the United Kingdom; consequently, the majority of Birmingham’s gun manufacture today is for the air gun sports trade. The Gun Quarter has continued to decline in the 21st century, losing approximately 25% of its manufacturing jobs in the 3 years from 2003 to 2006, and the trend is continuing, with many vacant and underused buildings. In August 2011 a controversy was created when the Birmingham Council, in an unwelcome move, decided to change the name of the Gun Quarter. The Council had received a petition from a mere 50 residents from a local church group to change the name to St George and St Chad’s Quarter. The Birmingham Post reported on the row; in response over 4500 signed a petition not to change the name. William Tranter – founding partner in B.S.A.